One day, while wondering how to vary blog content while still keeping with the book review theme, it dawned on me that readers tend to be interested in all aspects of book-making, not just the final product. With that in mind, I decided to ask several authors of books I’ve recently reviewed if they would like to answer some interview questions. Without exception, they all quite kindly agreed. I now plan to make this a fairly regular blog feature. My first interview is with Amy Thomas, Baker Street Babe and author of the recently released and well-received The Detective and the Woman (London: MX, 2012), an adventure which teams Holmes up with the Woman, Irene Adler. This is Amy’s first book, and I wanted to get her take on what it’s like to be a new author, as well as her experience writing Holmes, and her views on the enigmatic Irene Adler…. Is it true that The Detective and the Woman began as a NaNoWriMo project? Did you think of it specifically for NaNoWriMo, or had it been percolating awhile? And, the obvious question is: how in the world did you finish? Yes! It started as a NaNoWriMo project in 2011. I had heard of NaNoWriMo a while ago, and last year I realized that I had the time and the desire to actually take the plunge and attempt it. I didn’t tell anyone I was doing it for the first few days in case I couldn’t finish, but as I got going, I became more confident that I could do it. I’m not even sure how I finished—the novel actually took me seventeen days! I spent most of my free time writing, obviously, and I found the free tools on the NaNo website really helpful because they tracked my wordcount and gave me a way to make sure I wasn’t getting behind. Doing NaNoWriMo was also a chance for me to find the silver lining in a dark cloud, namely, the fact that I have active Crohn’s Disease, which is an autoimmune digestive disorder and major health challenge. Because of my physical limitations, I have a lot more time to devote to things like writing than I would have had if I was working full time outside the home. As far as thinking of the content of the novel, it was a combination of ideas that had been percolating in my brain and new ideas that came during November. I was very inspired when I re-read the Holmes canon in 2010, and many things in the novel are definitely a result of those thoughts. I encountered Sherlock Holmes some time before the age of ten. I remember being vastly creeped out by an audiobook that had “The Speckled Band” on it, and I went on to read many of the stories. I was extremely heartbroken when Holmes “died,” but my older sister took pity on me and told me about “The Empty House,” which, if I recall correctly, greatly annoyed my mother, who wanted me to have to discover it all for myself. Over the next few years, a friend introduced me to The Beekeeper’s Apprentice by Laurie R. King, and I became a huge fan of her Holmes series as well. What drew you to Irene Adler as a heroine? The Sherlock Holmes canon contains a very small quantity of feminine characters, and as an adult woman re-reading it, I found myself thinking about how I would respond to Holmes if I were a part of the stories and identifying, to some extent, with Irene Adler. I particularly enjoyed Irene’s lack of awe at his brilliance coupled with her respect for him as a man and an equal. In addition, I found her character arc in “A Scandal in Bohemia” fascinating because Holmes begins the story thinking of her as the villain and ends up regarding her as honorable, more so than his client. Irene has been used as a heroine, a villainess, or love interest for Holmes many times. How do you think your version of Irene differs, and how did you decide on the way in which you wished to portray her? One of the main differences between my version and others is that I wrote Irene primarily as a person, rather than as a woman. That isn’t to say she’s unfeminine. Conan Doyle emphasized aspects of her femininity, and I did as well; however, I wanted to explore her motivations and intelligence beyond her sexuality. I imagined what would have happened if Holmes and Irene had been thrown together again after “A Scandal in Bohemia,” and I found that the level of respect they both displayed for one another by the end of the story provided a solid basis for a friendship of equal minds, albeit one that goes through several necessary trials of trust. Irene is a bit of a blank slate in the canon, but Sherlock Holmes is not. Did you find his character hard to write? Why or why not? Did you try to mimic ACD’s version, are there other versions you used for inspiration, or did you let your imagination take over? 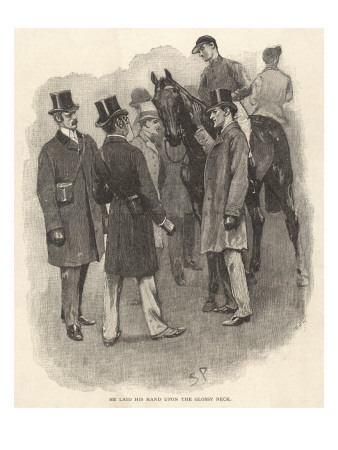 My story is a non-traditional pastiche in the sense that I did not seek to imitate Conan Doyle’s writing style or use Dr. Watson as a narrator. I was far more interested in exploring the psychology of Holmes and Irene and following their thought processes through a case. 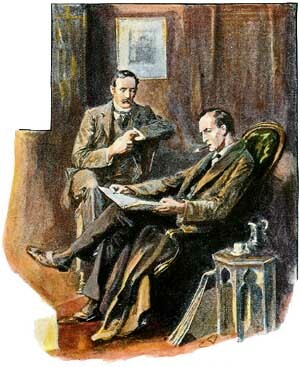 The canon is certainly my main influence, but Conan Doyle definitely did not approach his characters the way I did. As a result, my imagination had to take me from Holmes as he’s described by his creator to the more internal world I wanted to portray. Laurie R. King was an inspiration in this area because she provides a more internalized perspective than Conan Doyle. I did not seek to copy her portrayal, but I was inspired by her approach. My analysis of Holmes’s character had been part of my thought processes since re-reading the stories in 2010, so when I sat down to actually pen the novel, I didn’t find him difficult to write. His actions flowed from the idea of him that I had already formed mentally. Do you read a lot of pastiche? If so, do you have favorite authors, books/stories, or themes? I write book reviews for the Baker Street Babes, so I am always reading Holmes pastiches of all kinds. Laurie R. King is my favorite pastiche author, and I also think The Seven-Per-Cent Solution by Nicholas Meyer is an exceptional example of the genre. Generally, I prefer books that do not try to sound exactly like Conan Doyle because it’s very difficult to do well. You’ve written some fan fiction. Did you find this experience useful when writing The Detective and the Woman? Definitely! Fanfiction is great writing practice because there are many accessible ways to make it available online and receive feedback from readers. One of the only major differences between a quality work of fanfiction and a pastiche is that the second has been published for profit, and fanfiction can be a wonderful way for someone who wants to write a novel to get their feet wet. The positive comments I received from readers of my fanfiction helped give me the confidence I needed to write a full-length book and offer it to be considered for publication. You’re one of the Baker Street Babes, which is a very diverse group of young women. How did you all meet each other? I met a few of my fellow Babes through the Baker Street Supper Club, a fansite devoted to the BBC’s Sherlock television series. Several of them were already podcasting together when they asked me to join them to help interview Laurie R. King in 2011, and they invited me to join them permanently in early 2012 as a contributor to the podcast and one of the book reviewers for the website. What’s it like being a published author? Is it like you expected? What’s surprised you? The publishing process happened very quickly for me, much more quickly than I had ever expected. In some ways, I feel like I’m still in shock when I see my name on the front of a published novel. One of the main surprises has been the ease of the process, all the way from finding a publisher to the book launch. I know that my experience has been atypical in many ways, but I’ve been very blessed to work with a wonderful publisher (Steve Emecz from MX Publishing) who truly understands and supports Holmes pastiche. The Detective and the Woman is available through traditional online sites. It is also available from the Baker Street Babes’ shop; purchasing it there will help the Babes continue to add much-needed bandwidth for their popular podcasts.